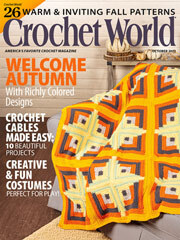 Bold colors and geometric designs make this free crochet afghan pattern noteworthy. Worked in panels of worsted-weight yarn, this cozy blanket is perfect for adding an interesting and unique touch to your home decor. Size: 43 1/2" x 65 1/2".